We offer a comprehensive range of treatments and aim to create a balanced natural smile for our patients. Dental Implants are a modern and effective tooth replacement solution. "Dental implants are a smart and effective solution to replace missing teeth"
Dental implants are the most popular and effective choice for replacing missing teeth. While most people will only act to replace a missing tooth with visual motivations in mind, there are also a number of physical and health related issues that will remain present if a missing tooth is left unfixed. Dental implants can repair a damaged smile to give a visually seamless look. An implant will also restore your smile to reduce the health risks associated with missing teeth. Dental implants are essentially screws that are surgically placed into your jawbone and serve as an anchor for porcelain crowns and veneers. Our dental implants are made from a titanium alloy which is a material that is highly compatible with your jawbone. The biocompatible nature of the screws allows them to fuse to your jawbone and become another functioning element within your mouth. The process of the dental implant procedure is always in two stages: the dental implant fixture stage and the restoration stage. During the fixture stage the dental implant is embedded into your jaw bone where the root of your missing tooth was. Eventually the dental implant will fuse to your jaw bone. In the restoration stage crowns and veneers are attached to the dental implant to complete the restoration of your missing tooth. Denture wearers usually complain about the loss of biting pressure and ulcers in the mouth as a result of wearing dentures. Since dental implants act in the same way as normal teeth, dental implants represent a more long-term and stable alternative to dentures. Missing teeth can severely affect your eating patterns, as your ability to eat and chew without pain may diminish. Gaps in your smile can distract from an otherwise perfect smile. It is important to address the gaps left by missing teeth as these spaces can instigate a number of oral health concerns. Unless your tooth loss was triggered by trauma (most likely if your tooth was knocked out) then it is important to determine the cause of your tooth loss. Dental conditions, such as periodontitis (advanced gum disease), is a dental concern that can cause teeth to become unstable and unsupported. By identifying the trigger for your missing teeth, our dental professionals can help you to regain your oral health. In addition to identifying the cause of tooth loss, it is also important to correct tooth loss to prevent other dental conditions from occurring. Gaps in your smile can cause teeth to shift and migrate in order to bridge the gaps left by missing teeth. This may not only damage the appearance of your smile, but it can also cause disharmony in the structure and positioning of your teeth. Tooth loss can also cause discomfort to the soft tissues in your mouth. For more information on a more permanent solution to missing teeth, please contact Honeysuckle Dental today. With new training, Dr Andrew is now fully qualified to administer local anaesthetic. My teeth have been missing for a long time, can I still have implants? The short answer is yes. There are many patients who are concerned that they have left their dental implant treatment too late in order to be a success. But when you come in for your initial consultation with us, we will thoroughly assess your suitability for treatment and especially whether you have enough jaw bone mass in which to place your dental implants. It is rare that you will not have enough bone mass in your jaw, but we do need to be mindful of the safety implications. How long will dental implants take? Usually, you will be able to have your teeth removed and a dental implant inserted in the same procedure. Although that is dependent on your specific case and will be determined by your dentist. However, there are cases where the implant must be inserted (the titanium screw) and given time to heal, allowing for it to fully fuse to the bone, before the porcelain tooth replacement can be fitted. The upper and lower jaw differ in the time it takes for the dental implants to merge with the bone, the upper jaw takes 6 months whereas the lower jaw takes approximately 3. If you have been advised to get dental implants it is not recommended that you wait to get them. If your teeth are damaged or missing this will lead to bone loss and if this happens then this may lead to you needing to receive more complex treatment in the future. If you choose to wait, simple actions like chewing will become increasingly difficult and cause you discomfort. Usually, the more complicated a procedure is, the more costly they are. Without having implants, your dentures will begin to cause you pain and discomfort as the bone in your jaw decays. Dental implants are a natural looking replacement for damaged or missing teeth. Not only do they take the place of the superficial tooth, they also replace the root. 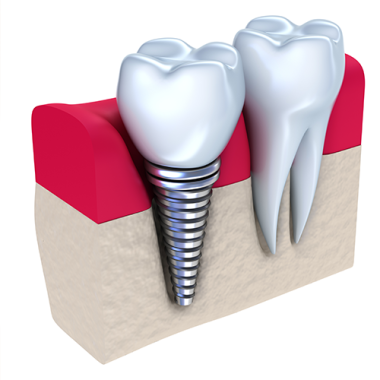 They are made of a titanium screw which is attached to your gum or the bone in your jaw to secure the implants in place. Whereas the visible part, the replacement tooth, is usually made of porcelain. Dental implants provide a support structure for the teeth they are taking the place of. And unlike dentures, they are a permanent solution, and so do not need to be removed from your mouth daily. We always do our very best to provide dental care that is accessible and affordable and while dental implants may appear to be expensive initially, what price would you put on anything else that has the potential to last you your whole life? Dental implants can transform you smile in a number of ways including improvements to your quality of life, appearance and function. Of course, the decision ultimately lies with you and we will never recommend any treatment that we don’t wholeheartedly believe will be in your best interests in the long-term. Is the treatment going to be painful? This is another concern that is quite common among patients who are considering dental implant surgery and if your treatment is being provided by an experienced oral health professional, it should be a relatively straightforward procedure to complete. Most implants are placed under a local anaesthetic and while the initial injection may sting a little bit, you shouldn’t experience any sharp pains for the duration of the procedure. What you may feel is some pushing and pulling but it will be a vague sensation and is not painful in any way and we will ensure that we check your level of feeling before we begin.